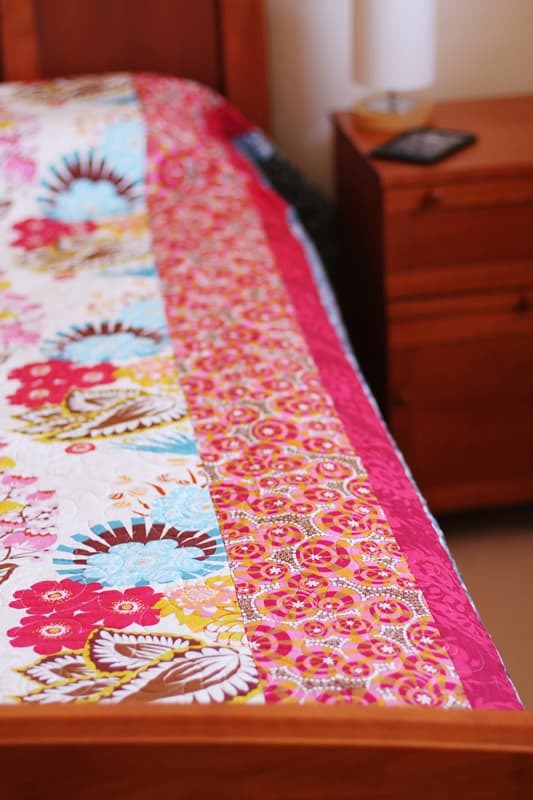 It’s time for the Blogger’s Quilt Festival over at Amy’s Creative Side. 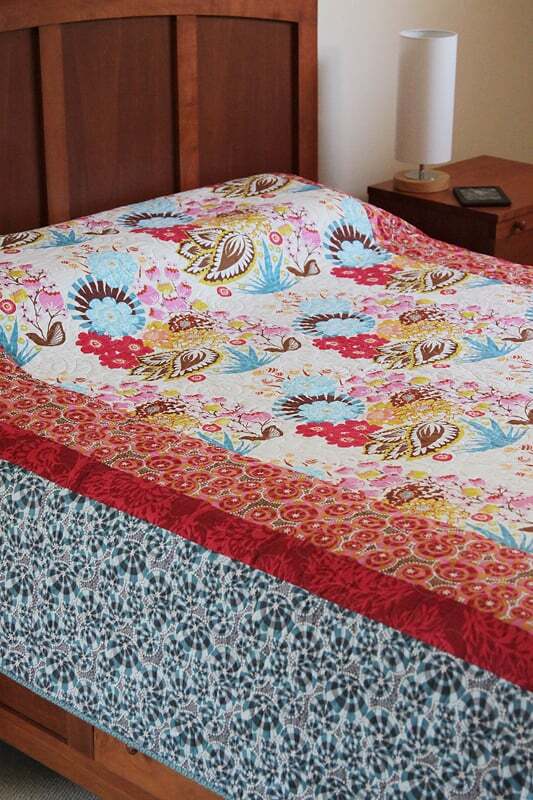 Here is the second queen sized quilt I made recently (first one can be seen here). 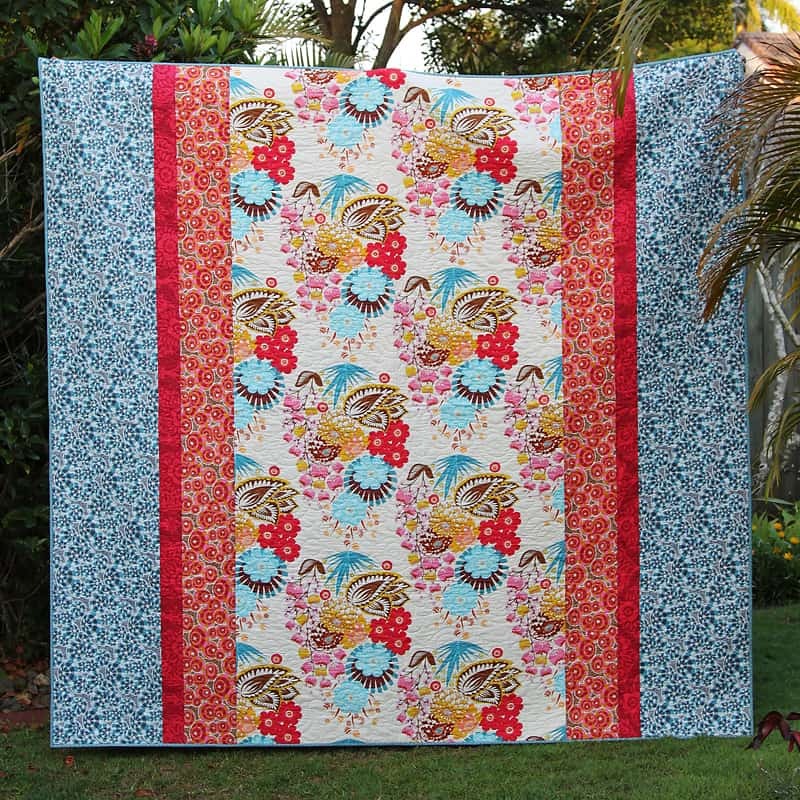 This quilt is full of beautiful saturated Anna Maria Horner colour and showcases the Summer Totem in Tart floral print from her LouLouThi fabric line. The quilt finished at 90″ x 90″. I backed the quilt in Carolyn Friedlander’s Crosshatch in Yarrow (wideback 108″) and had the quilt edge-to-edge quilted by a lovely local long-armer. 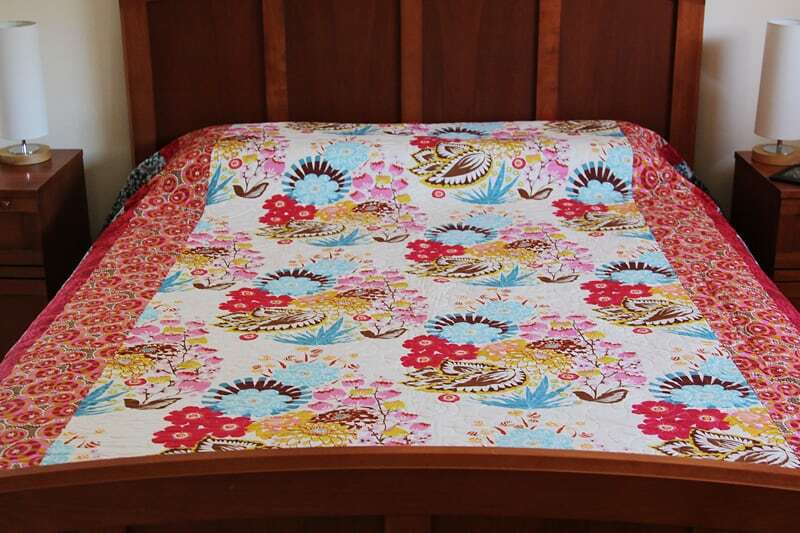 I really wanted to bind the quilt in the blue Buoyancy fabric however I used my last half yards in the quilt top and couldn’t find a scrap to buy anywhere. I did have an almost-half yard of Hugs and Kisses in Ocean and prepped it for binding only to find I was one strip short. I turned to Instagram in my hour of need (#greataussiedestash) and the lovely Tanya saved the day. Thank you, Tanya!! Another machine binding completed in a mere hour. I could get used to that! I have prepared a project sheet with the fabric requirements, cutting and assembly instructions for this quilt. It’s a free download for anyone who would like to sign up for my newsletter. So tell me, are you thinking about sewing a wholecloth-style queen quilt in the near future? I have to say, it’s very gratifying to have it sew up so quickly. I’m looking forward to snuggling under this one in about 7 months (it’s already averaging 28°C [82F] in my part of Australia so far this spring). Wishing you all a fabulous weekend with lots of sewing! 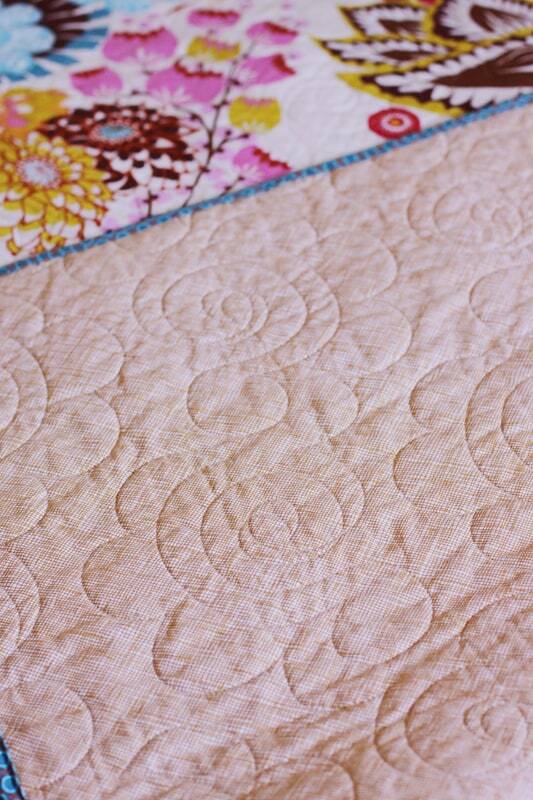 Linking up with Large Quilt Category at Amy’s Creative Side. I certainly have a whole cloth quilt on my future ‘to-do’ list! 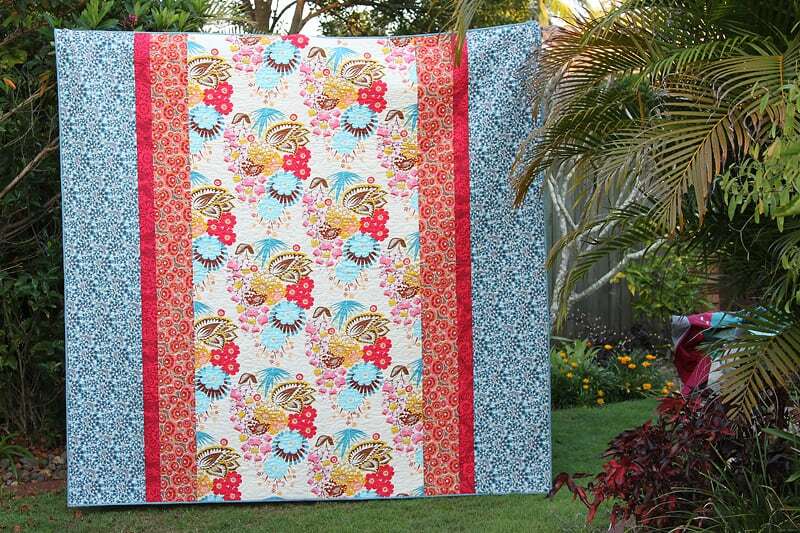 (But I want to hand quilt mine, Kantha style!) I am constantly on the search for that perfect piece of fabric! I love how you have combined the four prints here- beautiful Kirsty! You must be very proud of it! Simple and beautiful! That buoyancy fabric is one of my favourites, especially in blue-I wish I’d bought more. Yes a whole cloth quilt has been on my list for years too, just keeps getting bumped down the queue! I didn’t but after seeing this, I now have a hankering to make one. It will have to be added to the end of a long list though. Love your combination of fabric in this one.